KIVI, Ulla-Mari (2017) Born to read: children under school age and their parents in the library. Paper presented at: IFLA WLIC 2017 – Wrocław, Poland – Libraries. Solidarity. Society. in Session 112 - Poster Sessions. Alavieska is a little municipality in the countryside in Finland (less than 3000 habitants). Alavieska municipal library co-operates with the regional libraries (common library system, strategy etc.) The library wants to support children and the whole family to read more, which is the primary objective of this library project. 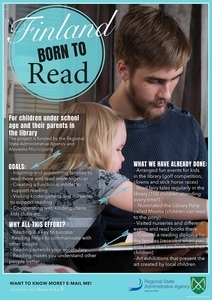 At the same time the library can product experiences for families with children (we have for example the real library pony, which listens while children are reading) and provide a library as a community meeting place for families with children. The target group is 0-6 years old children and their parents. During the project, we´ll create a practical and workable model that can be implemented in the library in the future. The project ends during the year 2017. The library staff gets important information, how and when is time to meet the families, nursery groups etc. during the year. The project funded by the Regional State Administrative Agency.